Amebiasis is an infection of the intestines. It is caused by the microscopic parasite Entamoeba histolytica. E. histolytica can live in the large intestine (colon) without causing damage to the intestine. 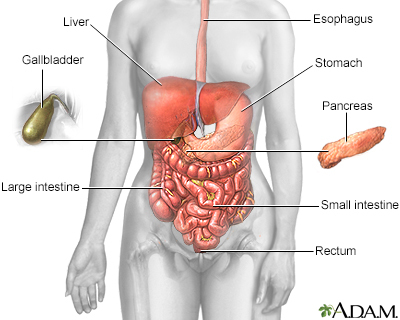 In some cases, it invades the colon wall, causing colitis, acute dysentery, or long-term (chronic) diarrhea. The infection can also spread through the bloodstream to the liver. In rare cases, it can spread to the lungs, brain, or other organs. This condition occurs worldwide. It is most common in tropical areas that have crowded living conditions and poor sanitation. Africa, Mexico, parts of South America, and India have major health problems due to this condition. 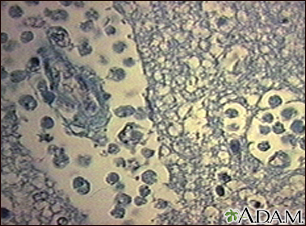 In the United States, amebiasis is most common among those who live in institutions or people who have traveled to an area where amebiasis is common. Most people with this infection do not have symptoms. If symptoms occur, they are seen 7 to 28 days after being exposed to the parasite. The health care provider will perform a physical exam. You will be asked about your medical history, especially if you have recently traveled overseas. 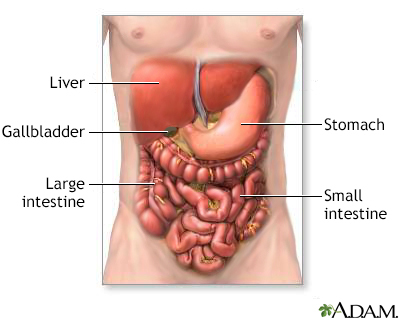 Examination of the abdomen may show liver enlargement or tenderness in the abdomen. Treatment depends on how severe the infection is. Usually, antibiotics are prescribed. If you are vomiting, you may be given medicines through a vein (intravenously) until you can take them by mouth. Medicines to stop diarrhea are usually not prescribed, because they can make the condition worse. After antibiotic treatment, your stool will likely be rechecked to make sure the infection has been cleared. Outcome is usually good with treatment. Usually, the illness lasts about 2 weeks, but it can come back if you do not get treated. Call your health care provider if you have diarrhea that does not go away or gets worse. When traveling in countries where sanitation is poor, drink purified or boiled water. Do not eat uncooked vegetables or unpeeled fruit. Wash your hands after using the bathroom and before eating. Bogitsh BJ, Carter CE, Oeltmann TN. Visceral protista I: rhizopods (amoebae) and ciliophorans. In: Bogitsh BJ, Carter CE, Oeltmann TN, eds. Human Parasitology. 5th ed. London, UK: Elsevier Academic Press; 2019:chap 4. Petri WA, Lima AAM. Amebiasis. In: Goldman L, Schafer AI, eds. Goldman-Cecil Medicine. 25th ed. Philadelphia, PA: Elsevier Saunders; 2016:chap 352. 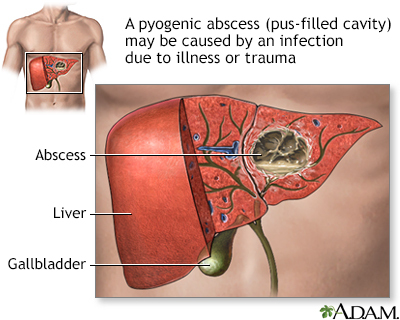 A liver abscess can develop from several different sources, including a blood infection, an abdominal infection, or an abdominal injury which has been become infected. The most common infecting bacteria include E coli, enterococcus, staphylococcus, and streptococcus. Treatment is usually a combination of drainage and prolonged antibiotic therapy.